A Boyds man who is new to Maryland politics says he is considering launching a bid for Congress in Maryland’s 6th Congressional District. 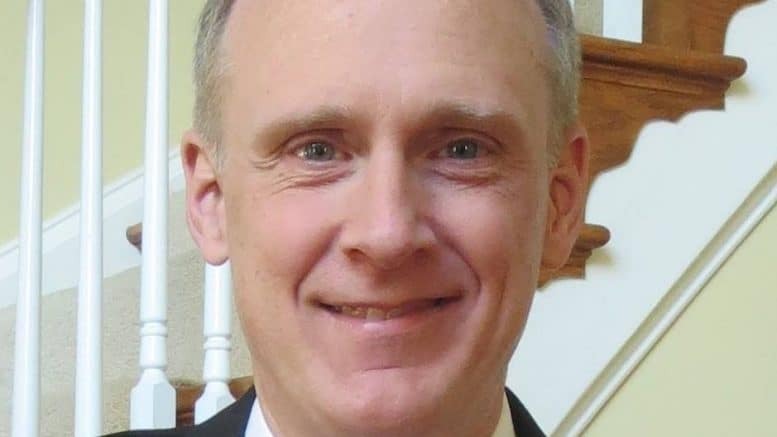 Adam McKee, 51, a software engineer and father of two, yesterday afternoon confirmed in a tweet that he’s exploring a congressional bid in the 6th – as a Republican. A source who attended the annual Washington County Elephant Club Thursday-evening reception reported to A Miner Detail that McKee was telling reception guests that he’s jumping into the race. A Miner Detail yesterday reached out to McKee for comment. I am in the very preliminary state at this point. I don’t have a campaign set up, no social media accounts, website or any of that. I just believe that we need a candidate that will support the President in his agenda to bring back prosperity to America. Amie Hoeber ran last time and I wouldn’t be surprised if she ran again, but I am not a huge fan, since she ran such an uninspired [sic] campaign last time. In 2004, McKee he and his wife, Robin, and his two sons – 17 and 11 – moved to Boyds and has lived there ever since. He received a Bachelor of Science degree in Computer Science from San Jose State University and has worked as a software engineer for over 25 years. I didn’t get any level of excitement over Amie’s campaign. Certainly not like Dan Bongino’s. In a year where Trump was drawing huge crowds everywhere she just quietly ran. I didn’t get the impression she wanted to tie her fate to Trump, even though I can’t imagine being able to win the seat had Trump lost. As for money, I don’t know. I’m new to this. I will be looking for advice from the central committee on that as well as reaching out on social media to Trump’s supporters on Twitter, YouTube, and radio, if possible. There are quite a few very popular faces that have been calling for normal people, such as me, who are not part of the “swamp” to run on common sense conservatism and support the President’s agenda. McKee has not formally registered a campaign finance account with the Federal Election Commission nor has he officially filed his candidacy with the Maryland State Board of Elections. While Hoeber hasn’t officially committed to a second congressional bid, she told A Miner Detail that she is having conversations with friends, supporters, and members of the Republican central committees, attending various events throughout the district and keeping active with the Montgomery County Republican Central Committee, serving as the committee’s finance chairwoman. Leading the MCGOP’s finance team, many Republicans have recently heaped praise onto Hoeber for her fundraising capabilities in supporting this year’s Montgomery County Republican Lincoln-Day dinner. The annual Republican gathering generated $35, 908.00 – up from the $22, 609.00 raised in 2016. The Democratic race to potentially succeed incumbent Rep. John Delaney, who is said to be considering a run for higher office in 2018, is abuzz with activity. Maryland House Majority Bill Frick is a congressional candidate in waiting. His recent fundraising email blast stated that he is ready to run for Congress.